Nerve-sparing radical prostatectomy has been the gold standard treatment option for men under 70 with early-stage, organ-confined cancer. The purpose of this procedure is removal of the cancer and, when applicable, preservation of urinary and erectile function by protecting the nerves that run alongside the prostate. Now, a less invasive approach to the surgery, using the da Vinci® robotic system, is becoming the preferred treatment for removal of the prostate following early diagnosis of prostate cancer. The success rate is greater than 92%, comparable to open surgery, without the risk or extended recovery time. 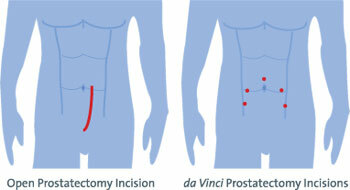 Studies even suggest that da Vinci Prostatectomy may be the most effective, least invasive prostate surgery available. 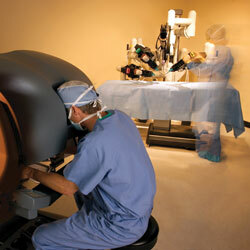 The da Vinci® system provides enhanced visualization and precision for our surgeons. The da Vinci Prostatectomy is performed under general anesthesia and typically lasts two to four hours. Small incisions, 1/4 to 1/2 inch in length, are made in the patient’s abdomen and ports are then inserted to keep the incisions open. During the procedure, our urologists use the da Vinci system’s laparoscopic surgical instruments and video camera, via the temporary ports, to direct the dissection of the prostate gland and adjacent tissue. When the surgery is complete, the ports are removed from the patient’s abdomen and the remaining incisions are closed with sutures. The da Vinci® Prostatectomy is minimally invasive, using 6 small incisions, 1/4 to 1/2 inch in length, compared to traditional open prostatectomy, which requires an 8 to 10 inch incision to access the prostate. A urinary catheter is then put in place and typically removed after seven days. The patient usually spends one night in the hospital recovering from the effects of the anesthesia. Depending on the individual, regular activities may resume as soon as a few days after surgery. Straining and heavy lifting are discouraged for the first four weeks after surgery. Some post-op incontinence is normal and is typically managed with medication or bladder control therapy. Erectile dysfunction may also be a side effect of surgery. Like incontinence, this side effect may be discussed with the doctor and managed with medication until it lessens or completely resolves over time. For more information about robot-assisted prostatectomy, contact Alliance Urology Specialists at 336-274-1114.